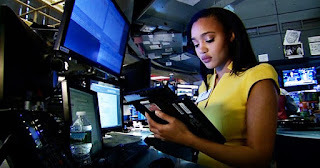 Lauren Simmons is the only woman that is a full-time employee at the New York Stock Exchange. And what's more, she's an African American! There are very few women who have occupied a trading position and have signed their name in the book that contains the constitution of the New York Stock Exchange alongside the likes of John D. Rockefeller, and Simmons happens to be one of them. Lauren Simmons, a 23-year-old Black woman, got her bachelor's degree in genetics at Kennesaw State University. While she was in college, she worked as a supervisor at Six Flags and interned at Woodstock Clinical Treatment Center where she created an innovative version of the center's resource manual along with a budget sheet of $300,000 after analyzing the company's past expenses. Moreover, her work portfolio includes an internship at Nordstrom and working at Saks Inc. for six months before joining Rosenblatt Securities last year. "I fell in love with the numbers and the fast movement, and the men in the trading jackets and everything was moving so fast and I'm loving it," she told BBC. The founder and CEO of the securities firm that hired Simmons, Richard Rosenblatt, says he is confident that "she won't be the last." Though artificial intelligence has been slowly replacing humans in managing stock portfolios, the New York Stock Exchange is still ultimately dominated by men. "They are like you're a woman, and you are 23, and you are a minority," Simmons said. "What are you doing, how did you get this job?" Rosenblatt, who has been in the trading industry since 1969, shared that the trading game is a very physical thing and that it didn't attract most women, "You and I would look at each other and try to figure out: How big an order did we have? How nervous did you look? How aggressive were you going to be?" For now, Simmons remains to be the sole female broker on the floor even though Rosenblatt has been trying to recruit other women. "We just hired a new person not too long ago and in the interview process, there weren’t that many female applicants, because they weren’t applying," Simmons said.